A young, electively homeless woman (Sandrine Bonnaire) drifts across the French countryside, trying to survive the harsh winter. Belgian director Agnes Varda has long been interested in using cinema as a means of delving deeply into women’s psyches and personal choices. In her experimental New Wave debut — Cleo From 5 to 7 (1961) — she shadowed a young singer anxiously awaiting the results of a medical test; sixteen years later, she made One Sings, the Other Doesn’t, a sincere yet didactic homage to feminist solidarity. In Vagabond, she utilizes a more strategically neo-realist approach to storytelling, while maintaining critical elements of both these earlier films: like Cleo, Vagabond‘s Mona is a self-absorbed, not-entirely-likable “drifter” who wanders from place to place; and, like lifelong friends Pomme and Suzanne in One Sings, the Other Doesn’t, Mona must struggle to survive in a male-dominated world. 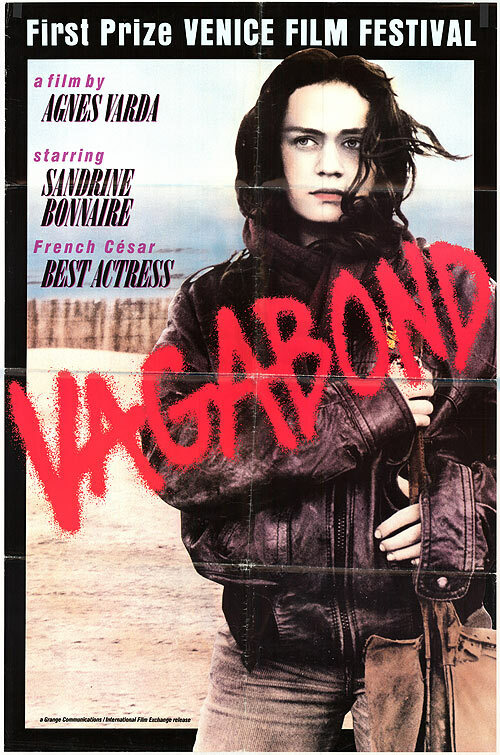 Of these three films, Vagabond is ultimately the most successful and satisfying, thanks primarily to Sandrine Bonnaire’s compelling, brave performance. 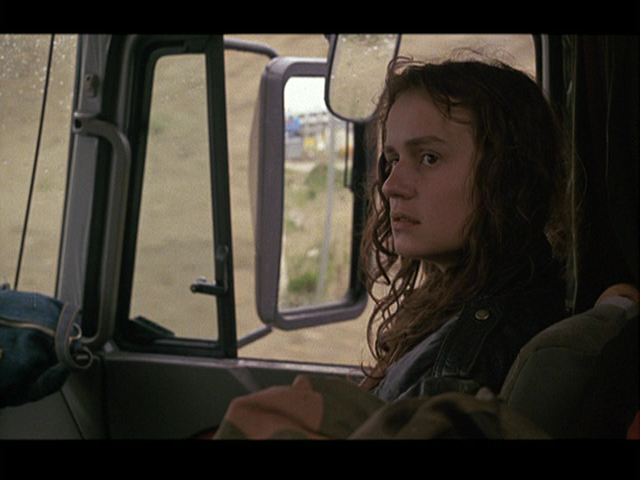 As in her screen debut (playing teenage Suzanne in 1983’s A Nos Amours), Bonnaire invests her character here with an air of studied yet vulnerable insouciance; in some ways, Mona is simply a radical, tragic extension of Suzanne. To her credit, however, Varda doesn’t try to frame Mona as overly sympathetic — she’s bitchy and conniving when she needs to be, doing whatever it takes to make it from day to day with a minimum of effort; she lacks overt initiative, and often fails to take advantage of the kindnesses offered to her. Although we never learn exactly why Mona is rebelling against even the most minimal strictures of society, it’s clear from the opening shot of her corpse that such an approach is doomed. 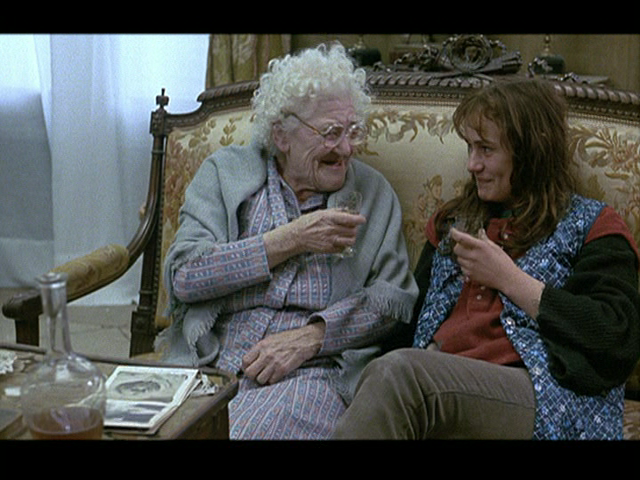 Throughout the film, she’s bedraggled, smelly, and occasionally feral — yet always fascinating and/or frustrating to those around her: just as Varda herself somewhat romantically posits Mona as “emerging from the ocean”, each character in the film is given a chance to comment on how they view Mona’s situation, thus making this more of a multi-faceted “reaction” story than simply a study in character. Vagabond is an undeniably harsh experience to sit through, but remains memorable long after the camera has circled back once again onto Mona’s frozen, lifeless body in a ditch. P.S. Vagabond also provides hints of Varda’s future interest in society’s “gleaners” — outsiders who scavenge off the leavings of others; perhaps more so than any other filmmaker, Varda’s sporadic corpus of work truly reflects her evolving viewpoints over the decades. Yes, for Bonnaire’s uncompromising performance. Listed as a film with Historical Importance, a Cult Movie, and a Personal Recommendation in the back of Peary’s book. It seems only a select few of Varda’s films have been readily available in the US. If one sees only one of them, this is perhaps the one to see. As noted, though, it’s tough to get through – and feels longer than it is. The main difference here is that – unlike director Mike Nichols – Varda, even as she shows Mona warts and all, appears to have elegiac compassion. Her film is elegantly shot – and she makes sure to show that many of those in/around Mona’s life were just as dismal; the point, I suppose, being that, in life, there are many more ‘vagabonds’ than those actually roughing it on the road. The second main reason for seeing the film is the genius of how Varda has structured the writing. A more straightforward approach of storytelling may have made the film simply unbearable. NOTE: For the sake of comparison, it may be interesting to see this on a double-bill with Bonnaire’s marvelous (very grown-up; just four years later) performance in Patrice Leconte’s masterpiece ‘Monsieur Hire’.